Ready to get the kids started out with their first go-kart? The TrailMaster MINI XRX model makes the best go-kart for anyone just learning the ropes. Kids will love how cool the model looks thanks to the design that almost mimics the body of the larger TrailMaster XRS. The go-cart even comes in your child's selection of six different colors. Parents can put any anxiety for their kids safety aside thanks to the meticulous security features designed just fort this mini model. First and for most, kids will have access to seat belts that will ensure they won't go anywhere if trouble should occur. The design also features padded upper brush guards and side railing to add an extra level of safety. Of course, the safety feature every parent loves is the two remote controller starter/stopper fobs that will shut down the go-kart from up to 100 yards away! The TrailMaster MINI XRX won't take your children over 12 MPH and is so simple to drive they'll be ready to take to the trails without your instructions after a few minutes of practice. 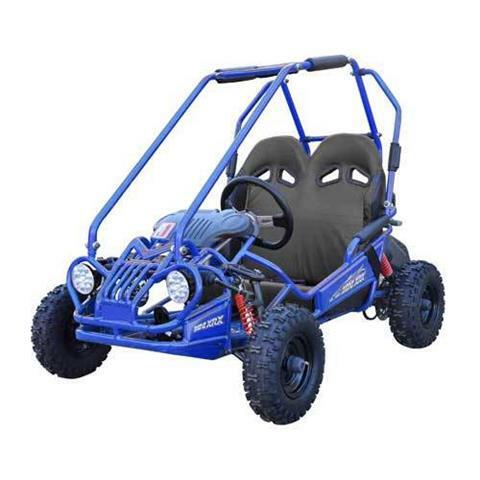 The go-kart has a four stroke engine, automatic clutch, electric start up and reliable disc brakes, which make it an awesome buy for the price.